“Oval Thread” was very popular during the coin period. At that time, knives were not made to match the pattern but were purchased separately, and this one went with many patterns. 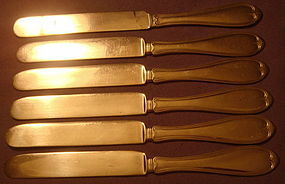 The picture shows 6 knives, but only 5 of them are coin – the 6th is plated and is included at no charge as a “completer.” The knives have no structural problems – no bends or burrs or pitting. There is softening of the surface design on one side – I expect that a monogram was removed and that side was overpolished.. The opposite side is fine – see the photo comparing the two. Length is 8 in. and weight of the 5 is 206 g. There is no discernible maker's mark, just evidence of what must have been polished away.